I have been busy these past few weeks doing a kitchen renovation. From chalk painting my cabinets to preparing for a new sink install. Pleased with the results and once I have the new sink in I will post before and after images. The whole process has taken a bit longer than I had hoped due to the cold, damp weather we have been having. The curing time for the paint has taken days and I did not want to "rush" that process. 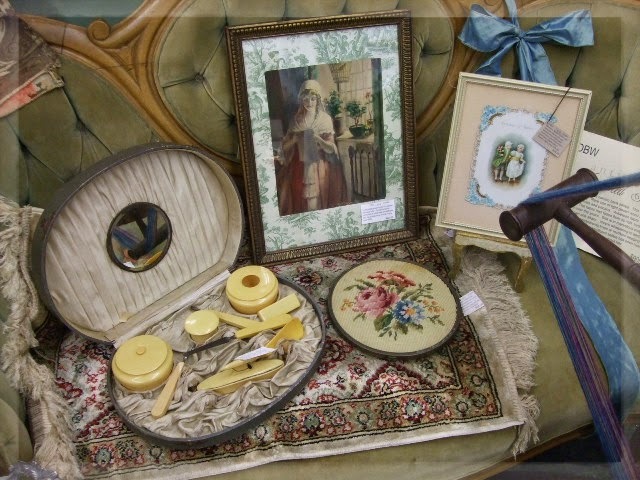 Had to get out and do a little treasure hunting, so Saturday, I was off to my favorite, local haunts. Uncommon advertising piece. EAPG nappy in the "Sawtooth Honeycomb" pattern made by Steimer Glass Company, circa 1906. This is an advertising piece for Bernheimer Brothers which was established in 1884 as one of the first discount department stores in America. Terrific Staffordshire Brown Transfer Platter. Pattern: Palmyra. Has chip on back. Circa 1840s. Close up of the lovely cabbage roses on this bowl. Sweet, fine bone china creamer marked Bavaria. Antique, Wm Rogers 1847 pie/cake server. Pattern: Silver (yes, Silver is the name of this pattern) Date issued: 1847. Pretty etched design on base. I had a hard time giving this one up, almost kept it. Vintage, Art Deco bride's basket. Silverplate. Bringing out the pretty flowered pieces now that spring will be upon us in a few months. Brought in another Edwardian day dress. This one is fine, cotton batiste with machine embroidery on the bottom, the bodice and sleeve cuffs. Very wearable size. Copper clad baby shoes delight me and I found several this weekend. I have given these at baby showers filled with ear swabs or cotton balls. This delightful valentine baking dish is too cha cha for words. Fell in love with this adorable print of a toddler and puppy gazing at the frog. Such a sweet theme for a child's room. 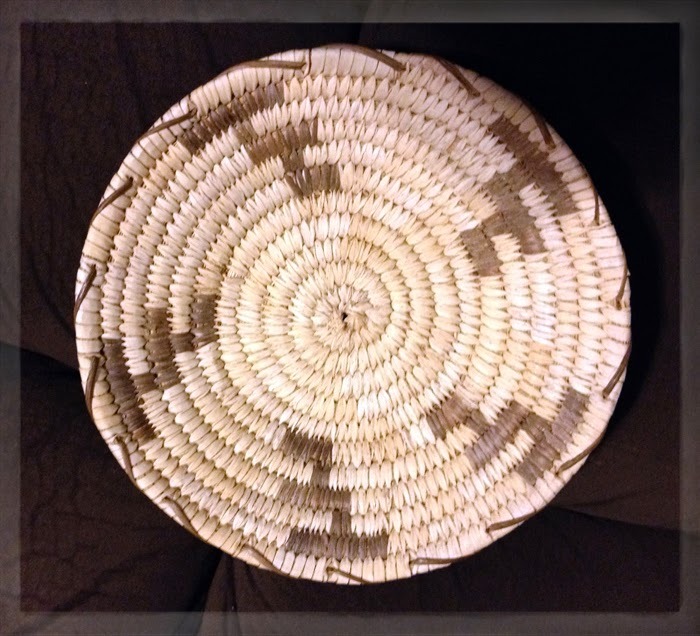 Lovely Pima, native American basket was found in a thrift store for a dollar. This beauty is now in my personal collection. Was head over teakettle with this find. As I was passing through downtown Lawrenceville, I spotted a shop I had never been in before. So I parked the vehicle and went in to see what I could find in Nancy's Candy and Spice Shop. Nested between two restaurants, Nancy's windows are warm and welcoming and when you cross the threshold into the store you are filled with marvelous scents of the spices offered there. Open bags of fresh spices for food preparation, these are the freshest and moistest I have ever seen in a spice shop. 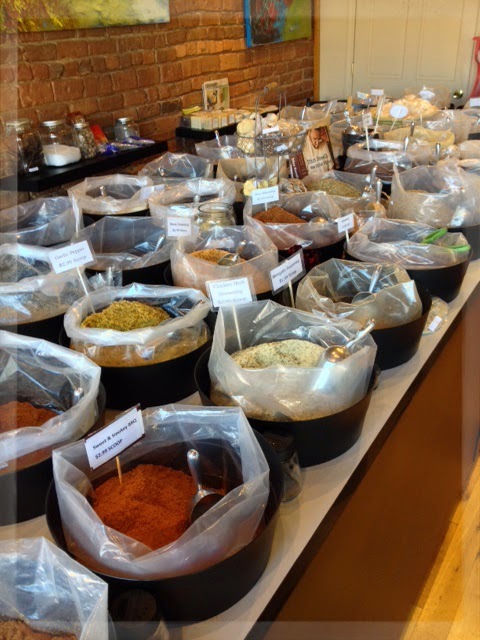 Nancy is knowledgeable about all of them and happily shares how each will enhance your cooking. I purchased a bag of "Green's Seasonings" and "Lime Pepper". I can't wait to use the "Green's" on my steamed vegies and the Lime Pepper on a NY strip. 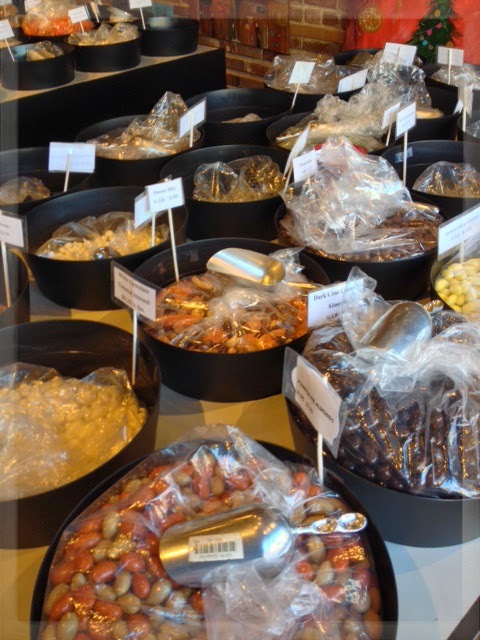 The opposite side of the shop contains bags of chocolate covered almonds and other nuts and dried fruits. White, dark, milk and yogurt dipped. Brought home a bag of giant almonds dipped in Lemon Citrus. Amazing. 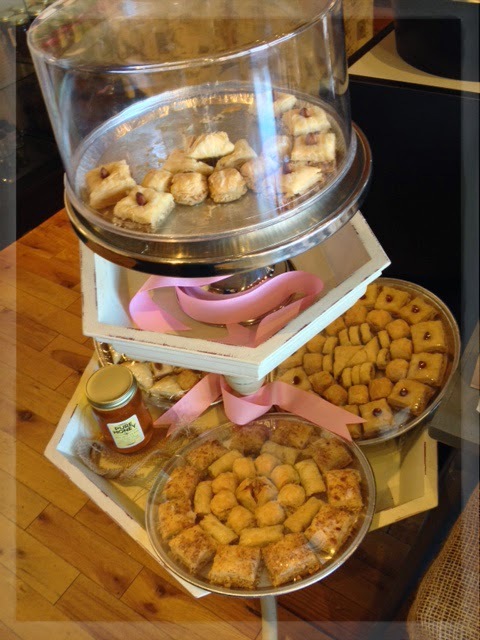 As I checked out, there was a display of freshly made Baklava. Something I have a weakness for, so I purchased two small squares for dessert with my coffee that evening. 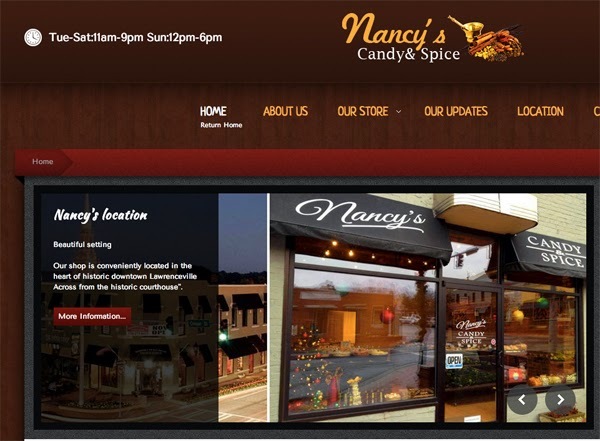 Nancy's Candy and Spice is a lovely shop that truly is the "original aromatherapy" with all of the marvelous spices and candies contained within. The Arctic blast is still keeping us wrapped up in my layers of clothing that we care to admit. Hope everyone stays warm and wishing all a gentle week. Blessings to you and those you love, Sea Witch.